Do you know all APL+Win enhancements since APL+Win v3? 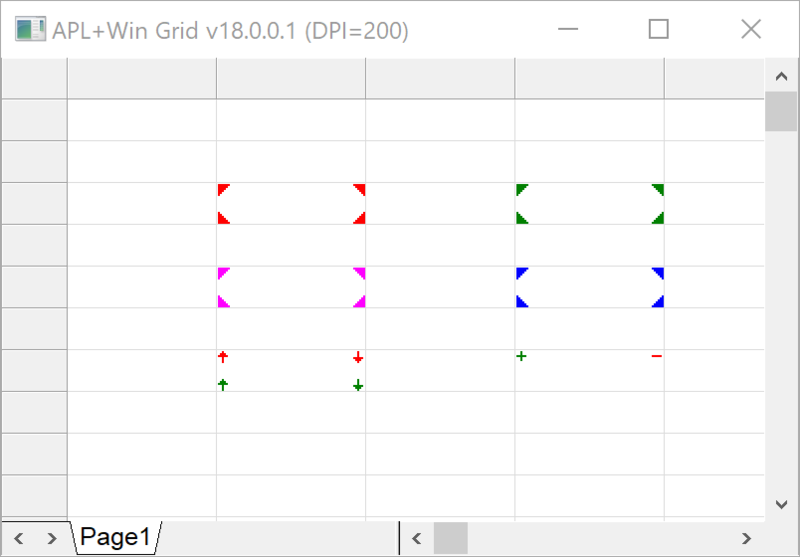 Are you using all the new features available in your APL+Win interpreter? Check the APL+Win New Features database and become a better APL+Win Developer! The APL+Win Grid has been adapted to display nicely under all resolutions and notably resolutions higher than 1080p (1920x1080 pixels) or DPIs higher than 100. 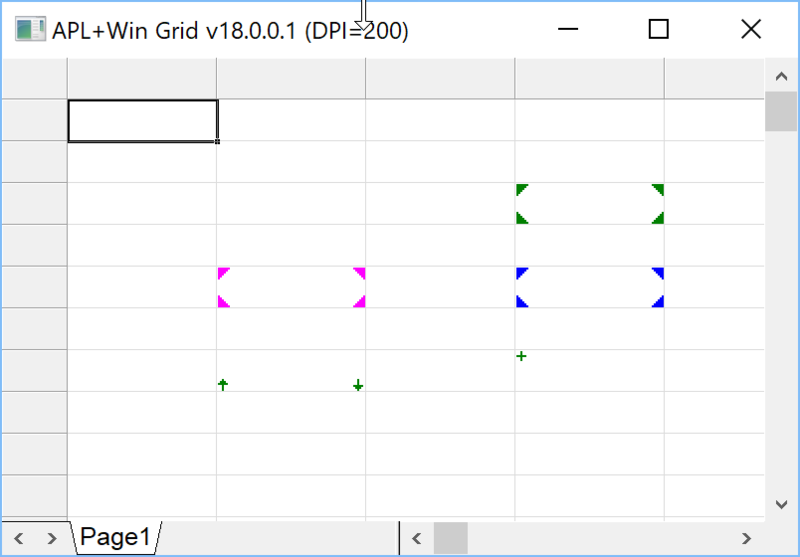 The APL Grid has been enhanced to always operate with the same DPI awareness as the APL+Win application. 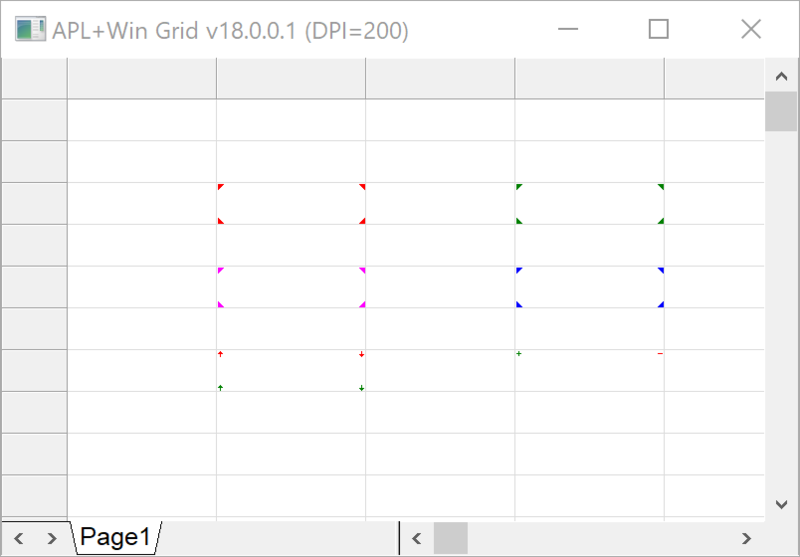 It is possible to re-register the APL+Win v17 grid after you have registered the APL+Win v18 grid and vice versa. The ⎕userid System Function now returns the name of the user currently logged into Windows. In previous versions ⎕userid was returning 15 blanks. The xImageMask property allows to specify a transparent color for the images displayed in cell corners when using the xImage and xImageFile properties. The example function below allows to test this new property. The xImageScale property allows to scale the images displayed in cell corners when using the xImage and xImageFile properties. The example function below allows to test this new property. I am using a 200 DPI screen. The new EnableSSE2 INI file parameter is set to 0 by default, thus not enabling the SSE2 experimental speedups; you can set it to 1 to enable them. SSE2 is a computer processor architecture and associated instruction set which provides for a single instruction to process multiple data items. 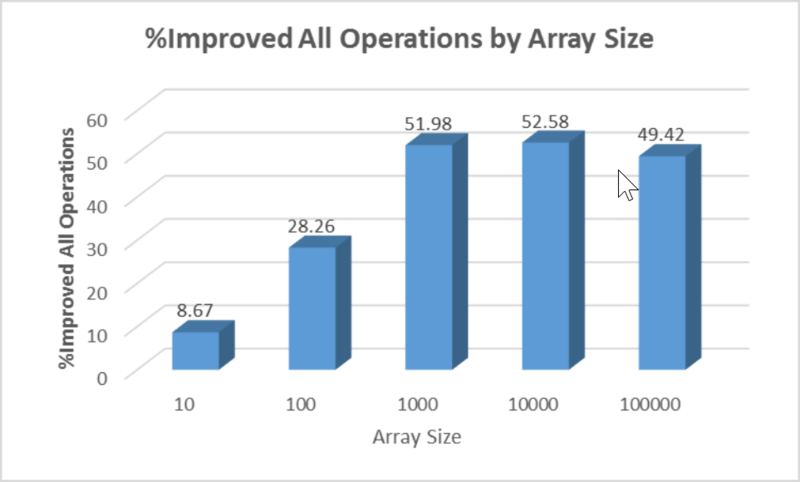 Its application to APL+Win array operations has beneficial effects on performance. When the EnableSSE2 .INI file parameter is set to 1, the SSE2 instruction set is used to optimize array-based arithmetic operations: + - × ÷. 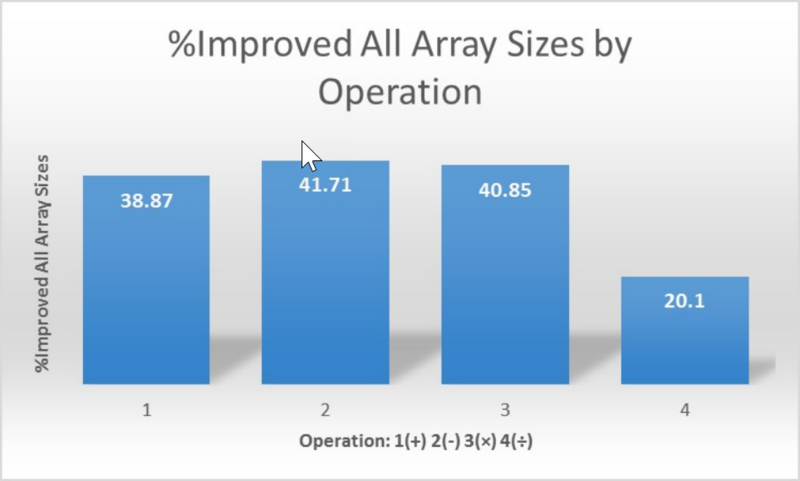 These array operations can run up to twice as fast as without SSE2 enabled depending on the size of the processed array. The DEMO_SSE2.W3 workspace is included in this release to test this enhancement. The new DEMO_SSE2 workspace in the APL+Win v17.1 Examples folder contains functions to test the SSE2 speedup enhancements. The new style property value 65536 has been added to the Button and UButton objects to allow their caption to wrap when the width of the caption is wider than the width of these objects. This enhancement improves the default font selection process for ⎕wi objects when running in DPI aware mode. This dramatically improves the font size versus window layout behaviour when running at high DPI scaling levels. The scale property has been extended to support scalemode = 6 to return true pixels. returns 1 if APL+Win is running in DPI aware mode; 0 if DPI un-aware mode. 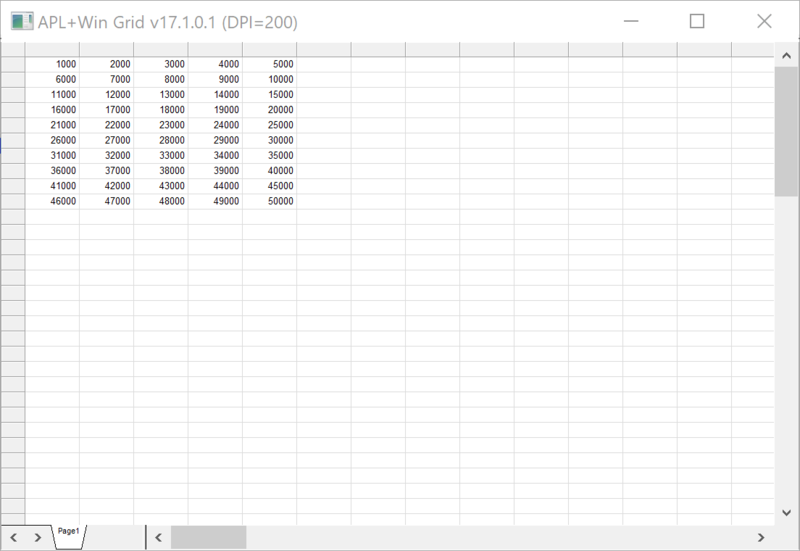 returns the system-wide DPI scaling percentage of the system (100 by default, 200 for 200% scaling, etc.). 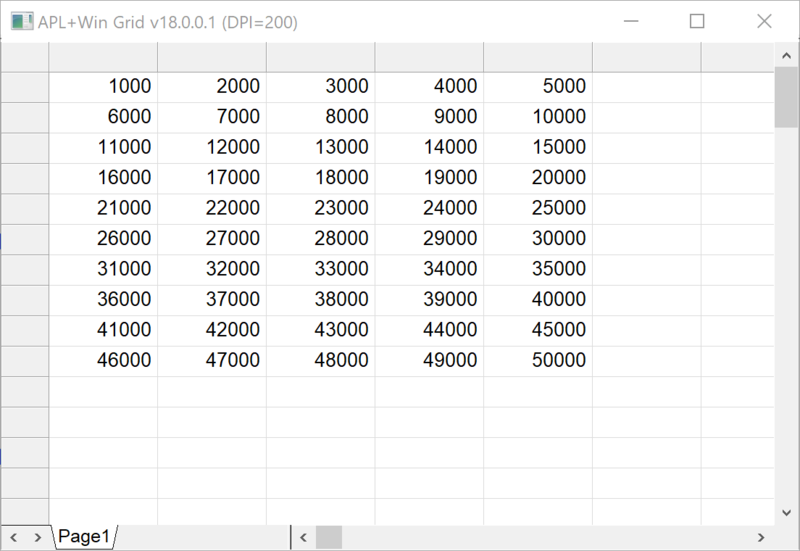 returns the dots per inch of the system-wide DPI scaling (96 at 100% scaling, 192 at 200% scaling, etc.). returns the pixel height of the default font. The CSE installer has been updated: “APLNext CSE Components Setup v3.0.24.0.msi”. Before running the CSE installer check the file’s properties to be sure it is not ‘blocked’. The CSE installer registers ActiveX components of the CSE on the target workstation, therefore elevated privileges are required to properly install the CSE. The CSE installer has been updated: “APLNext CSE Components Setup v3.0.24.0.msi”. Before running the CSE installer check the file’s properties to be sure it is not ‘blocked’. The CSE installer registers ActiveX components of the CSE on the target workstation and puts .Net components in the Global Assembly Cache, therefore elevated privileges are required to properly install the CSE. The CSE installer will now install the CSE to a 32-bit or 64-bit version of the Windows operating system. This version of the CSE requires APL+Win v17.0.01. Features of the CSE which rely on accessing large memory spaces are not available when the CSE is installed in a 32-bit Windows operating system environment. Refer to CSE example #192. It is now possible to create, collapse and expand regions in the Editor like in most modern editors. ⍝ expanding all regions at once, etc. ⍝ functions you are working on! APL+Win now supports using Hexadecimal numbers (i.e. 0x3FE is the same as 1022, etc.) and Binary numbers (use 0b prefix). The ⎕fx System F>unction now accepts a nested vector of character vectors as its argument. The Random Link System Function has been updated to support several new pseudo-random generation algorithms (Extended Historical Multiplicative Linear Congruential Multiplier, Mersenne Twister, Subtract with Carry). The SendInput 32-bit API Windows function has been added to the APLWADF.INI and APLW.ADF files. The colon (:) character followed by a space at the beginning of any statement in a user defined function suppresses any output this line would otherwise produce. The monadic Sink primitive (←) suppresses the output from any instruction in an APL function or in the APL Session. The new ⎕cm Character Matrix System Function can be used to normalize any character argument into a character matrix result.